A Palestinian teenager succumbed to his wounds on Monday three days after being shot by Israeli forces during clashes on the Gaza border, the health ministry in the coastal enclave said. 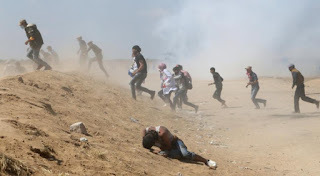 In a statement, health ministry spokesman Ashraf al-Qudra said Abdul Raouf Salha, 14, "died as a result of his injuries from (Israeli) occupation fire last Friday east of Jabalia" in the northern Gaza Strip. Israel accuses the strip's Islamist rulers Hamas of orchestrating the protests and using them as cover for violence. The Israeli army said Friday around 13,000 Palestinians had taken part in violent "riots" in multiple sites along the border. It had not responded to a request for comment on the teenager's death on Monday. At least 243 Palestinians have been killed by Israeli fire since protests began in March. The majority have been killed during protests and clashes, though others have died in airstrikes or shelling.